Continuing our week-long rundown of broadcast TV's latest and greatest offerings, we now look to Fox. And Fox is in some trouble. The network lost a huge chunk of its audience last season due primarily to aging product (looking at you, American Idol), and then the powers that be gave programming head Kevin Reilly the heave-ho before the ad sales division had a chance to shift all the inventory in their new slate. That's kind of a shame because it's a slate with some serious cojones, even if nothing is a total slam dunk. There are five new fall series on Fox, one of which (Utopia) has already begun life—ish—with three nontraditional dramas and a traditional sitcom getting ready to go in the next few weeks. It's worth noting my analysis below (as with my take on ABC's lineup) is based on each series' pilot, and shows often change in their later episodes. For our purposes, though, as a publication covering the ad industry, it's important for marketers to know how the shows they've invested in are going to strike an informed viewer at first because frequently that first chance is the only chance a new show gets. What is it? An hourlong serialized crime drama of 10 episodes, and the American remake of critically worshipped English show Broadchurch, with almost nothing changed in the first episode besides the setting and David Tennant's accent. It's written by Chris Chibnall, one of the better writers on Doctor Who and Torchwood, and it stars Tennant alongside Anna Gunn as Emmett Carver, a shifty detective new to a small town, and Ellie Miller, the local mom who's been on the force for time out of mind. When is it on? Thursdays at 9:00 p.m. starting Oct. 2. Is it in a good timeslot? If you're fielding a new drama that can't air before 9 p.m., your options are limited. Fox is putting this up against Scandal on one side and football on the other, which is maybe not an ideal place for it, but the network clearly has high hopes for a long life for Red Band Society and so have given that show the best real estate, Wednesdays at 9. Is it any good? Yes, it's excellent. David Tennant is a tremendously compelling performer, and everyone who watched Breaking Bad knows how good Anna Gunn is. Chibnall's script, for the pilot at least, is more or less identical to his script for the English version, but it's a good script. Interestingly, the American remake will shift pretty dramatically as the show goes along, with a completely different ending planned. It is darker than dark—as daring as anything on cable and all the more impressive for its presence on broadcast. Here's hoping audiences reward it. Does it stand a chance? There's a lot of audience overlap with Scandal, and that show is a monster. Both shows are going to skew female, both are of interest to people who like heavy drama, both have compelling leads and interesting women in them. Expect this show to balloon on DVR, and expect Fox to thank its lucky stars it sold so many C7 GRPs this year. Do you want your brand associated with it? It's a great show, and if you're an automotive brand or a theatrical brand, you're golden. All others, beware—this is why this kind of programming comes from the U.K., right? Ad time is limited, the government runs the biggest TV network, programmers can do more or less whatever they want. I cannot even imagine drawing the short straw and seeing your brand's logo after it's revealed that a little boy has been found murdered (which, if I'm not mistaken, is the beat before the A pod). They're going to make sure the adjacencies are as painless as possible, but Fox had probably better drop some promos or PSAs into those early spots to blunt the impact of a very effective show. What is it? A multicam, laugh-tracked sitcom executive produced by Lorne Michaels based on the stand-up comedy of 32-year-old former SNL writer John Mulaney. It stars Mulaney, SNL vet Nasim Pedrad and Mulaney's fellow stand-up comedian Seaton Smith, with regular appearances by Martin Short as John's boss and Elliot Gould as his neighbor. The show was piloted by NBC, but when the network passed, Fox picked it up for six episodes and then ordered an additional ten when it liked what it saw. When is it on? Sundays at 9:30 p.m. starting Oct. 5. Is it in a good timeslot? It's OK. I see the rationale behind the Family Guy lead-in, although I'd have reversed their positions—the show's sense of humor is comparatively dry where Family Guy's is scattered and wacky, and Brooklyn Nine-Nine would be a better introduction. Looking at the schedule, it doesn't seem too bad until you remember that Sunday evening is a scheduling minefield of HBO events, prestige-y FX and AMC series, and sports. Is it any good? I'm zagging where others have zigged here, but yes. It is good. Mulaney himself isn't terribly comfortable in front of the camera, and the whole meta-sitcom thing is a little strange (there are jokes about Seinfeld and Friends). But I'm confident that it will grow into good-strange, rather than just strange-strange. And the supporting cast! Martin Short is solid gold as Mulaney's boss, Pedrad is a perfectly confident foil to Mulaney's own pent-up anxiousness, and Seaton Smith's self-promoting comedian character is great. Elliot Gould brings some texture that probably isn't, y'know, there, to his character, a middle-aged guy who's never seen out of his bathrobe, but that's the only real writing problem. Does it stand a chance? Hopefully so. Reilly hadn't picked up a bad sitcom in a while (Brooklyn Nine-Nine is amazing), and this one gets better and better. It might take a few episodes to find its audience, but with Short providing a certain amount of older-skewing star wattage and some younger viewers sticking around after Family Guy, it has a decent shot at life beyond Season 1, especially if Fox wants it to syndicate eventually (and you don't greenlight a laugh track if you can't sell it to a cable network later). Do you want your brand associated with it? Sure, it's funny and inoffensive, and it's a pretty serious bid for off-net sales. So if it gets picked up to a second season, you'd be smart to see if you can work out an integration. What is it? A serialized hourlong drama about the early years of Batman ally Jim Gordon, from Bruno Heller, creator of The Mentalist and co-creator of HBO's late, lamented Rome. Fox won the show in a bidding war and immediately ordered it direct to series without bothering with a pilot first. 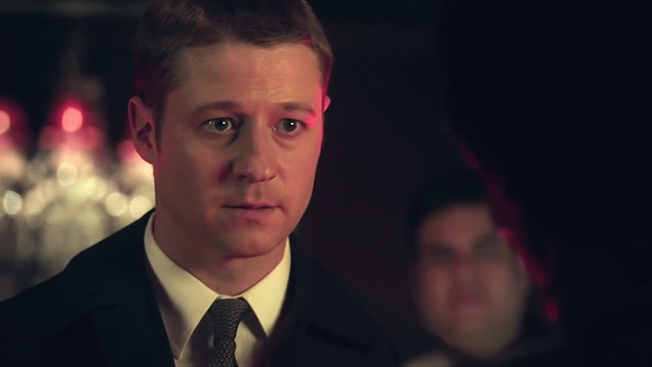 The show stars Ben McKenzie, whom longtime Fox viewers may remember from his teenage years on The O.C., as Gordon, and Donal Logue as his partner, Harvey Bullock, along with several other, younger actors as fledgling criminals who will grow up to be members of the Batman rogues' gallery. When is it on? Mondays at 8 p.m. starting Sept. 22. Is it in a good timeslot? It's a gutsy one, that's for sure. The first few episodes of Gotham will go up against The Big Bang Theory, a show that averages a whopping 6.2 in the demo, and there is a metric ton of overlap between Batman lovers and Big Bang aficionados. Timeshifting should be interesting on this one, as should Big Bang's move after a few weeks back to Thursdays. Is it any good? I would love to answer that question with an unequivocal yes. Absolutely love to. Like Red Band Society, Gotham's heart is in the right place, it has lots of great young actors, but (also like Red Band) it is terribly confused and tests credibility often and vigorously. At one point Bullock and Gordon get into an argument about whether or not the incredibly corrupt Gotham City Police Department (which, one suspects, wouldn't care if its constituent members skipped work to set nuns on fire) is going to bring the hammer down on them for shooting a suspect who was innocent of the crime he was being questioned for, but did run down the street shooting at them. Jada Pinkett Smith plays a mob underboss named Fish Mooney, who exists for absolutely no reason other than to eventually get overthrown by The Penguin, at which point someone will doubtless realize that penguins eat fish. All that said, Robin Taylor, the actor who plays The Penguin, is stellar, as are McKenzie and Logue (although is Logue being punished or something? Why doesn't he have any laugh lines? ), and when John Doman shows up at the 11th hour, the series improves dramatically. The pilot has lifted scenes out of every neo-noir from L.A. Confidential to Miller's Crossing and of course Christopher Nolan's own Batman films, but hey, those are good movies. Will it survive? Yes. People will forgive its faults for as long as it takes Heller to work the kinks out, if for no other reason than that you can sell anything with Batman on it, and it has the potential to become a really interesting younger-skewing Scandal with appeal to both genders. Its real challenge is just getting past those first few be-Bang-ed weeks. McKenzie, it has been pointed out to me by more than one person, is dreamy, and there are enough nerd shout-outs to keep the fringe element (speaking!) entertained. Do you want your brand associated with it? You do. It's much less brutal than Gracepoint and will probably draw a lot of the same people, and hey, Batman. What is it? An hourlong dramedy about high-school-age teenagers in a long-term hospital ward where each suffers a debilitating or fatal disease, based on the Catalan TV show of the same name. The series was originally developed for U.S. TV by Marta Kauffmann, co-creator of Friends, but the show didn't move forward; Fox (which lost a bidding war to ABC for the first iteration) is moving ahead with its own version of the series with Margaret Nagle, creator of My So-Called Life, running the show. When is it on? Wednesdays at 9:00 p.m. starting tonight, Sept. 17. Is it in a good timeslot? Very. Wednesdays at 9 gives it competition only from elderly crime shows and Modern Family. Is it any good? I am apparently a huge grinch for saying this, but it is not that great. Don't get me wrong: the kids are delightful. Every one of them is acting his or her heart out, and the two protagonists—a kid from a poor neighborhood who risks everything to get the doctor he needs, and a bitchy cheerleader—are both incredibly compelling. But there's so much that just leaps out as wrong or lazy. Why is a girl with an eating disorder in the same ward as a bunch of kids with cancer, and why on earth doesn't the nurse make sure she eats her food? Because that's definitely the way it gets done IRL, as the kids are saying. Where in heaven's name is the feeding tube for the kid in the coma? Since when does a hospital keep smokable medical marijuana in an unlocked supply closet? In fact, what condition or severity of condition do these kids share, besides a natural spunkiness and good humor in the face of overwhelming odds and apparent unlimited credit at a high-end hospital? Everything but the kids' performances feels phoned-in and half-finished, and that's a crying shame because everyone here deserves better material. Also, if you have seen the underrated psych ward drama It's Kind of a Funny Story, you have seen this show, right down to the '70s rock soundtrack. It's a solid attempt to draft material that reaches a YA-novel-reading audience, but I suspect it's underestimating that audience pretty handily. Will it survive? I don't think so. It's airing at 9 p.m. and it needs a younger audience to get the numbers it needs, and it's alternately too dark and too cloying. If it picked one or the other it might work, but there's enough on cable for this target audience that they're not really obligated to give Red Band Society much of a chance. Do you want your brand associated with it? Well, it's aiming for a youth market, whether or not it succeeds, so that's good. None of the potential adjacencies were too bad. Its politics are fairly liberal, so if your customers are really angry about, I don't know, teenagers smoking weed, be careful, but otherwise you're good. What is it? Utopia is an American version of a Dutch reality series that, on paper, sounds a little like a cross between Survivor and The Truman Show. The series puts into an otherwise unpopulated area a group of 15 different people with big personalities and conflicting ideas of what would make a perfect society. The experiment will last for a year (unless it gets canceled) and is livestreamed on several different simultaneous webcam feeds via Fox's homepage for the show, for which the network charges an access fee of $4.99 a month. With American Idol on the rocks, Fox needs another big, headline-grabbing reality franchise, and they've spared no expense here—the show cost a reported $50 million to produce and much of the expense went into eliminating the "softly scripted" feel so many reality shows have now. The crew is "a good couple hundred yards away," according to an exec, and the property on which the show takes place is filled with little robotic cameras and microphones to help contestants forget that they're being watched. When is it on? Tuesdays at 8:00 p.m. starting Sept. 7. Is it in a good timeslot? Yes, it's in a very good timeslot—Tuesdays at 8 is probably the best spot you could have for a new drama provided there's nothing that would push it back to 9 or 10 p.m. in terms of content; Fox chose to give Red Band the 9 p.m. slot on Wednesday, but it might have been wiser to give Red Band the 8 p.m. spot, put Gracepoint in Red Band's home on Wednesday, and move Utopia to Fridays. Is it any good? Look, it's very easy to criticize somebody else's hard work when you don't have any personal stake in it. It's also fun, educational, and sometimes it just makes you feel good inside, so let's begin: Utopia is hateful. It is aggressively vile. It fired on Fort Sumter, assassinated Archduke Ferdinand and sold plans of West Point to the British. And it does absolutely nothing that hasn't been done a thousand times before except spend money like a drunken sailor who has read Atlas Shrugged too many times. Low budgets are supposed to be the only reason to do reality television in the first place, so why, Fox? Why? The show has been a huge headache from day one and is not visibly much different from CBS' Survivor except for the livestreams of the players, which, ha, $4.99 a month? Probably not. The 15 contestants on the show range from a cruel jerk to a pitifully exploited homeless person (who fight each other, yay! ), and the first half-hour (during which the contestants—brace yourselves—pack a crate) abandons the no-interference premise of the show. Honestly no matter how weird or catty or just plain mean any of these people are, within the space of the pilot I just became horribly sorry for all of them. And here's the thing, leaving out any kind of subjective moral judgment or high-minded artistic objections: When you spend 50. Million. Dollars. Of someone else's money. It would be a good idea to spend it on something the audience can see. Does it stand a chance? It lost 55 percent of its audience in its second frame and it didn't generate much interest to start with, so expect it to bite the dust some time fairly soon. Do you want your brand associated with it? It's not likely to generate enough buzz to pick up a boycott, but woe betide you if your product is alcoholic beverages because those cause some problems in Utopia. If your brand is a safer creature comfort—macaroni and cheese, skin lotion, an upcoming movie—a show about sad people in a world where that product doesn't exist will probably be great for you.